I love food. This is no secret to those who know me. (I’ve struggled with my weight all of my life.) 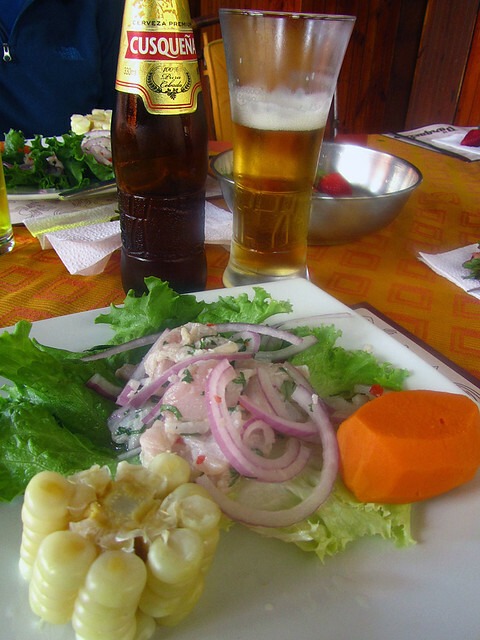 Fortunately, I’ve found a sort of fitness equilibrium, because since arriving in Peru a month ago, I’ve been eating like a king. I knew Peruvian food was good before I started this trip, so I had some warning. 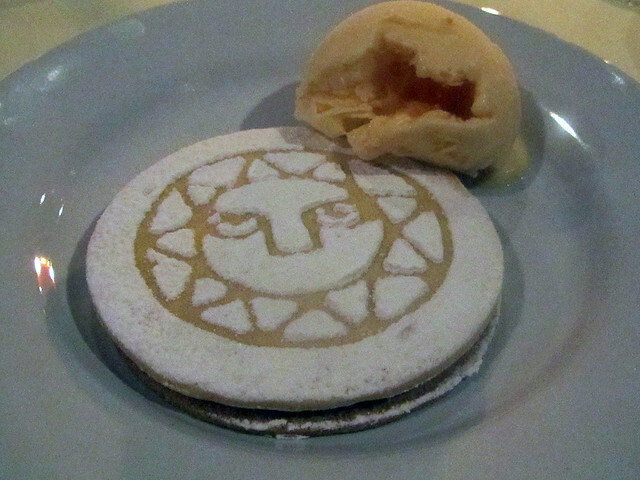 (One of Portland’s best restaurants is Andina, where I’ve dined many times.) But I wasn’t prepared for the constant quality at every meal. My wife joined me in Lima a few days ago, and since then we’ve been enjoying the Culinary Peru excursion from Gap Adventures. To start, our host Andrés took us to the Surquillo market, which is something like a supermarket except that it’s filled with individual vendors who mostly sell fresh meat and produce. 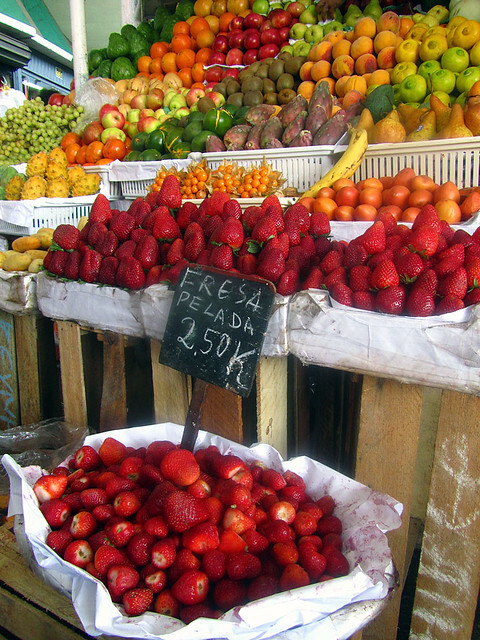 For instance, here’s a stall with strawberries (for a dollar a kilo! ), bananas, lúcuma, apples, avocados, passionfruit, and more. That beer was just the start of our drinking. 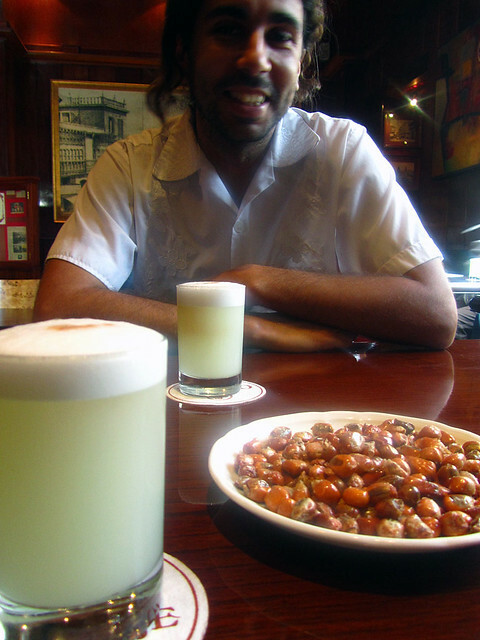 Next, Andrés took us to downtown Lima, where we visited two of the bars that claim to have invented the pisco sour, which has become the emblematic cocktail of the country. Pisco is a colorless grape brandy common in the Andes; a pisco sour mixes pisco, lime juice, egg whites, sugar, and bitters. Over the next couple of hours, we drank three pisco sours. At our last stop in Pueblo Libre, we decided to take the edge off the alcohol by grabbing snacks at one of Andrés’ favorite bars, Antigua Taberna Queirolo. The jamón sandwiches and papas rellenas (stuffed potatoes) helped, but what I really enjoyed were the picarones I bought in the nearby plaza. Picarones are like donuts, but they’re made from a pumpkin and sweet potato batter, and they’re drizzled in sugar cane and fig syrup. Lomo saltado was fun to make, but it was even more fun to eat. After lunch, we stopped next door at Senora Buendia for some actual tejas. 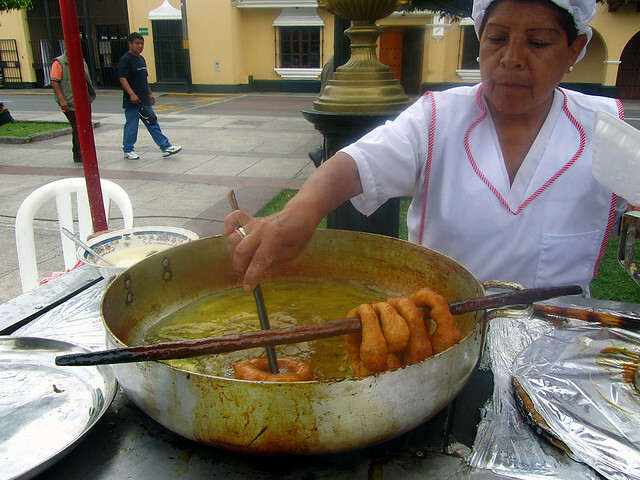 A teja is a Peruvian “sweetie” (as Andrés called them) made of a sugar shell filled with dulce de leche and fruits or nuts. They’re small, cheap, and delicious. Note: Though Peruvians eat plenty of Snickers and Sublimes (a local candy bar), traditional treats like tejas can be had if you know where to look. Andrés also took us to a local bodega (the ubiquitous corner store, very much like a U.S. minimart) and asked for un beso de moza (literally: “a kiss from a young girl”), which was a chocolate-covered marshmallow. Last night, for instance, we walked from Miraflores to the heart of the Barranco neighborhood to find Sóngoro Cosongo, which Andrés had recommended for anticuchos (beef-heart kebobs) and picarones. 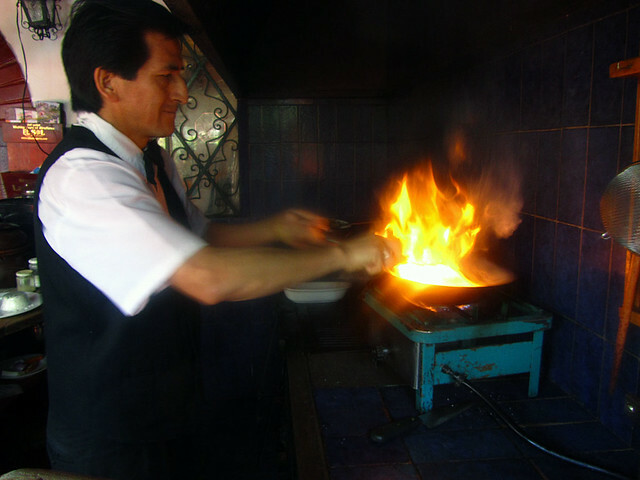 Today, we’ll stop by Punto Azul, which he suggested for ceviche and seafood. And I still haven’t tried chifas, which is supposed to be a delicious Peruvian twist to Chinese food. And, best of all, after nearly a month in the country, I’m finally ready to relax and try street food. I heard enough horror stories about food poisoning that I was reluctant to dabble in more informal delicacies at the start of the trip. I didn’t want to ruin my treks by having to be confined to bed — or the toilet tent. Now, though, I’m willing to take more risks. That means plenty of snacks from street vendors. With nearly ten million inhabitants, Lima is a big place. And Peru is bigger still. There’s no way that a quick 48-hour tour can fully cover the rich culinary tradition to be found here. And though I’ve eaten broadly over the past month, there’s no way that five weeks is enough time to sample the complete range of the cuisine either. That’s okay. I’ve enjoyed the food I’ve tried. And besides, this gives me an excuse to come back for more, right? 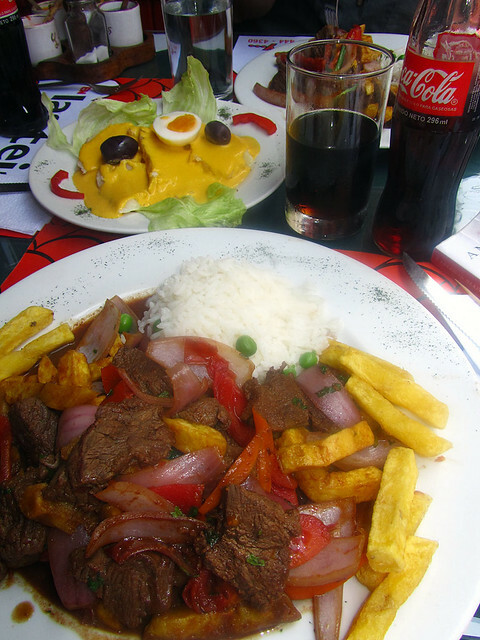 Note: My favorite Peruvian food by far? 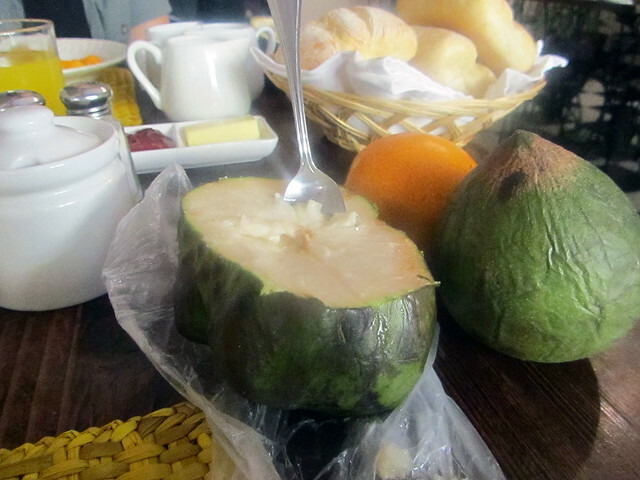 The humble maracuyá. The passionfruit.